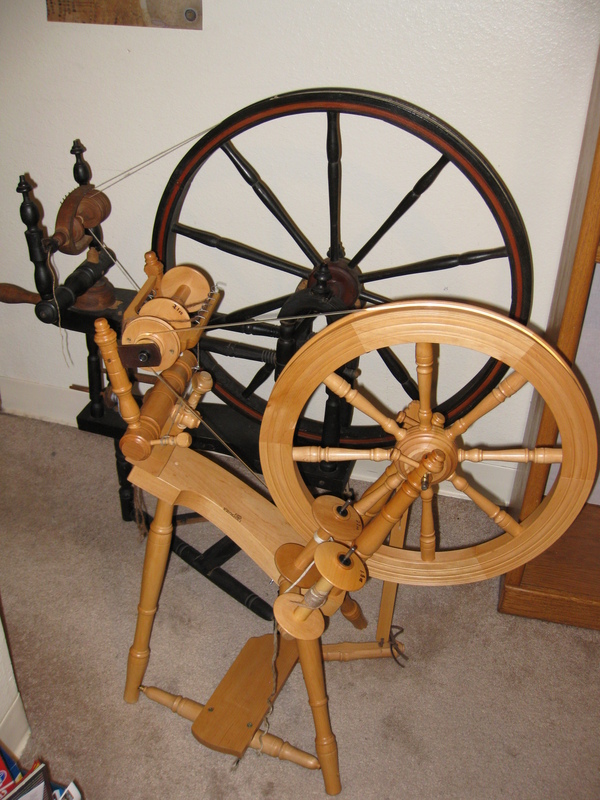 Even though it was made by a third generation wheel maker, my spinning wheel is brand new. It was made when I ordered it, for me. Anyone in my family will tell you: I’m not a great share-er. But there’s definitely something magical about a well-used antique wheel. Aunt Geri's new, old wheel. 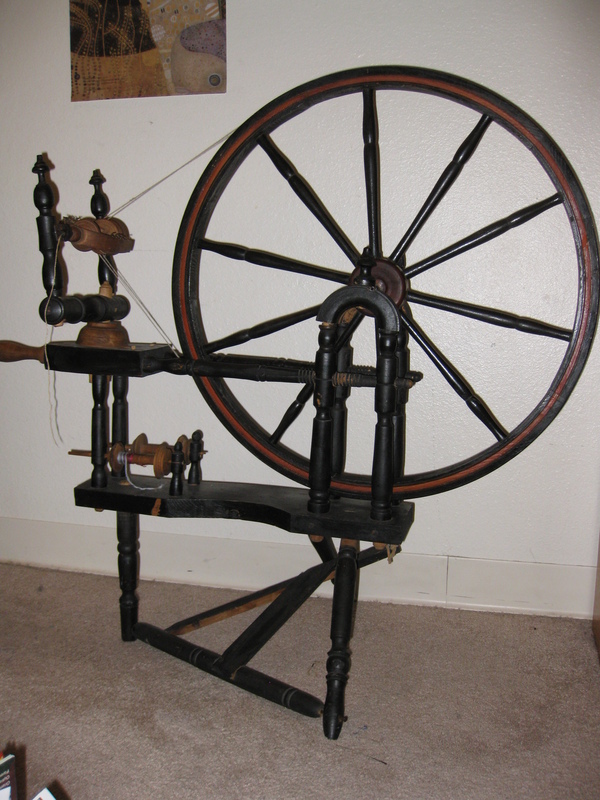 Aunt Geri’s new, old spinning wheel is an antique she found in her father-in-law’s basement, and it is beautiful. Her mother-in-law bought it from one of those wizened old midwestern women. We’ll probably never know who made it, or even who used it, but we can make some guesses about what it was used for based on the make of the wheel itself. And it’s fun to speculate about the history it has seen. First of all, as you can see from the picture above, the wheel itself is large in diameter. Like the bike gears on your back tire, the larger the wheel, the faster it spins. 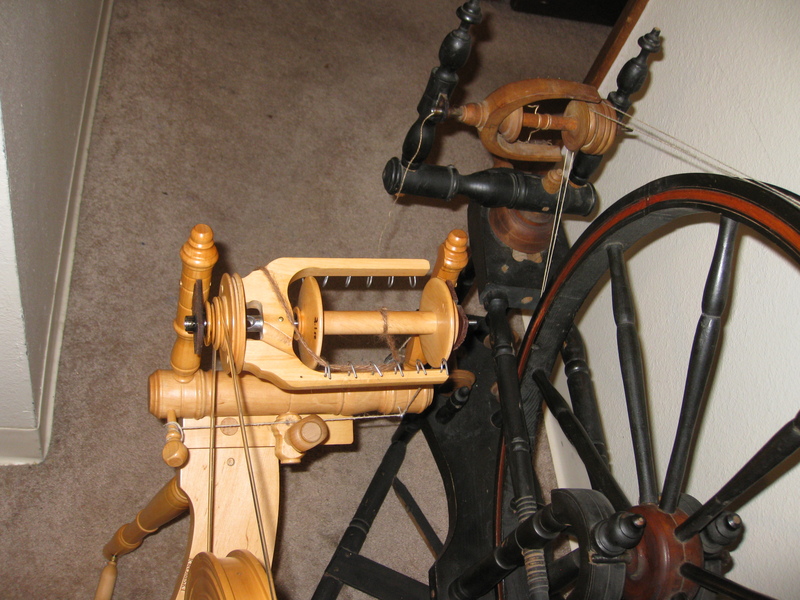 The faster the wheel spins, the more twist is put into the yarn each time you press down the treadle. This would make the wheel great for lace weight yarn or even thread, since the thinner the yarn, the more twist you need to lock the fibers together. Looking at the mother-of-all parts of both wheels (the top part in the picture), we can see some other differences. First, even though my wheel is relatively tiny, my flier (the bit with the hooks on it) and my bobbin (where the yarn ends up when you spin) are HUGE. This is another hint: my wheel was designed for artsy-fartsy yarns with beads and feathers stuck in them, whereas Aunt Geri’s wheel was designed for something thinner. 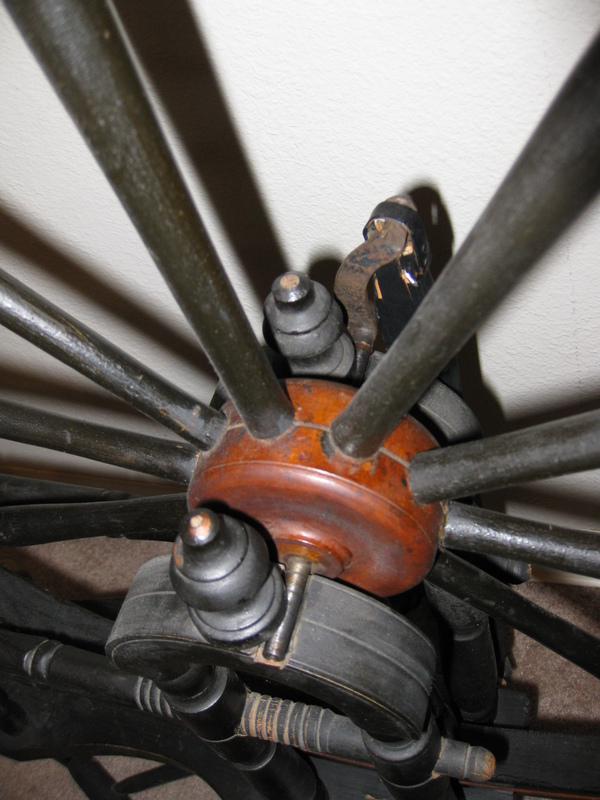 Her wheel is also a double drive, with a drive band on both the bobbin and the flier. This type of wheel produces more consistent yarn, but is also less flexible. All signs point the same direction: this wheel was probably used for spinning thread or lace weight yarn. Aunt Geri was kind enough to let me borrow it to spin the suri alpaca roving we got from Archie’s fleece. Suri alpacas have very fine, almost hair-like fiber, and yarn from them is best spun thin and lacy. It takes FOREVER on my wheel. Although it is not a beginner’s wheel, it has the most pleasing whir as it spins. I might have to video it so you can hear it too. It’s meditative. This entry was posted in fiber art and tagged alpacas, antiques, bobbin, hand spinning, handspinning, midwestern women, old spinning wheel, spinning, spinning wheels, suri, suri alpaca. Bookmark the permalink.